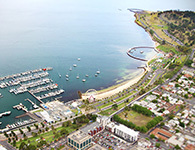 There is no other second tier city quite like Geelong in Australia in terms of making the most of our opportunities. Our rich history can be told through the amazing architecture that you will see throughout the city as we were founded on the gold and wool booms of the 18th Century through our international port, then a proud heritage of manufacturing, and now we have transformed into a smart city based on education, health and research. We call Australia 'The Lucky Country' and there is no where that expresses this more than Geelong. Keep following Study Geelong and we will ensure you have the best educational experiences possible which will give you a competitive advantage in your later career. We are proud to be educating the next generation. If you are looking for a university degree, Deakin University has two campuses, one on the Waterfront and the other in Waurn Pounds, offering undergraduate and postgraduate programs. Deakin is currently ranked 3rd for graduate employability in Australia and ranked 5 stars for world-class facilities, research and teaching, as well as employability, innovation and inclusiveness. Deakin College can be your transition into an undergraduate program, with their different entry pathways or Deakin University English Language Institute (DUELI) can help you to enhance your English skills prior to commencing further education. Avalon College a unique English language school, provides the very best care and educational programs for young international students, aged 10 to 18. The Gordon Institute of TAFE also offer English language courses. If Vocational Education and Training (VET) is what you are looking for, you are in luck, as The Gordon has a broad line-up of certificates, diplomas and advanced diplomas with a focus on hands-on learning. They take pride in their graduates being work-ready. AGB Training, a registered training organisation welcomes international students into diverse course options, each of which has been developed to act as a pathway from education into industry, whilst Marcus Oldham College is Australia’s only independent agricultural and equine business management college, offering students a unique educational experience. However, if what you need is a secondary school, Geelong can provide you with a high standard of education, supporting students on many different levels, academically as well as socially and emotionally.